Perched on the Pacific Ocean, with more than 300 days of sunshine per year, an active, healthy way of life is part of Santa Monica’s DNA. Thus, many health and fitness practices – trendy and endearing – have begun here, and continue to emerge. The city offers classic, healthful options that allow travelers to truly take care while on vacation, and return with a rejuvenated glow. Start with the obvious: the beautiful Pacific Ocean is perfect for surfing (named one of the best spots for beginner surfers! ), paddle boarding, swimming, etc; the miles of expansive beach dotted with volleyball courts are waiting for a little competition; ride the 22-mile South Bay Bicycle Trail that stretches along the shoreline; or visit the nearby Santa Monica Mountains, which offer dozens of trails for day hikes of all levels, with stunning ocean views. Additionally, countless studios offer virtually every discipline of yoga, Pilates and other fitness classes with some of the country’s premier experts. If you prefer to take your yoga practice outdoors, several beachfront hotels offer yoga on the sand. Or, kick it up a notch with Zumba on the Deck at Santa Monica Place. If classic fitness is too tame, explore more unexpected and even unusual ways to get healthy during a trip to Santa Monica. How many people have taken flying trapeze lessons while on vacation? Or the artful nuances of synchronized swimming (it’s harder than it looks!). Santa Monica isn’t just home to some of the most fun and unique fitness options around, it’s also where visitors and locals alike can find the Original Muscle Beach. Known as “the birthplace of the physical fitness boom of the 20th century,” Muscle Beach was and still is a landmark in the worlds of bodybuilding and workout. On any given day, tons of people visit Muscle Beach to take advantage of the rings, swings, chinning bars and jungle gym that still stand there today. But, wellness isn’t just about working out your body, it’s about nourishing it properly as well. The old adage “never trust a skinny chef” meets its exception in Santa Monica, where world-renowned culinary minds make up a food scene that caters well to health-conscious travelers, stretching the palate far beyond menus of tofu and lettuce. Indeed, Santa Monica is home to the top farmers’ markets in the country, and plenty of world-class chefs who create artful cuisine with the ingredients sourced from them. Many of Santa Monica’s luxurious and boutique hotels offer menus that accommodate virtually any dietary need. 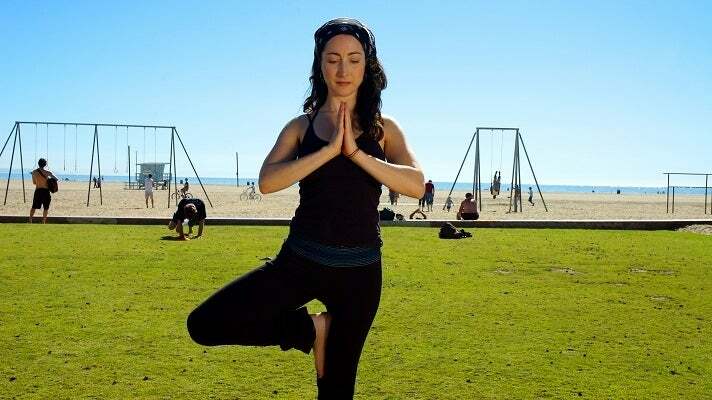 With all the delicious and health-conscious cuisine and the fun and diverse fitness options in Santa Monica, it’s easy to live well and feel well in this city by the beach. The views don’t hurt either!